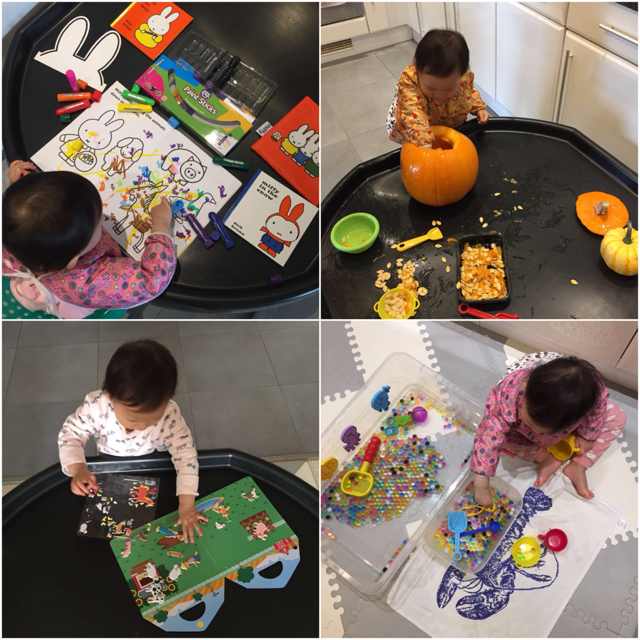 We have been doing lots and lots of activities on the tuff tray recently and I just haven't found the time to put collages together to share with you all. I have been getting into a bit of a comfy/lazy routine the last 2 months which consists of coming home from work, cooking, bath and bed before 10am and rather enjoying it really because I am waking up refreshed daily! Rest is over and I am back blogging sharing more activities with you all since you enjoy them so much on my Instagram. Anyway here is another simple collage showing you some of the past / current activities. 1. Top left colouring in with paint sticks - I cannot highly recommend these enough! 2. Top right was pumpkin carving from last year and our very first one. She really enjoyed the mess and we finished it off by painting the pumpkin using the paint sticks. 3. Bottom right - one of her favourite water beads with scoops, pots and bowls. She can spend a very long time playing with these and never get bored!